If you want to sell a diamond you should speak with our diamond buyers. Our GIA Certified Gemologists can provide a free appraisal of your diamonds value. 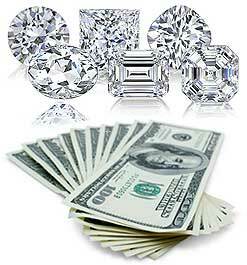 This allows us to offer the best price for loose diamonds or diamond jewelry. We are known throughout the Boston area for consistently offering top dollar for diamonds. If you’re going to sell diamonds in Massachusetts you need to visit The Gold Rush. We are known as being a best place to sell diamonds. We buy certified diamonds and non certified diamonds of all types. We buy loose diamonds and diamonds mounted in jewelry including wedding rings, engagement rings, bracelets, necklaces and more. We encourage you to bring in chipped or damaged diamonds, European and old mine diamonds. We can give you a free appraisal and make an offer to buy your diamonds in about 15 minutes. We invite you to bring us your diamonds or diamond jewelry for a free appraisal. We make selling your diamonds very easy. After our appraisal we will make you a price offer for our best possible payment. If you agree to sell us your diamond we will issue payment to you in our store within a few minutes. When you sell your diamonds here, within 15-20 minutes you can be in and out with cash in your pocket. There are many variations in size, shape and quality of diamonds. A combination of factors determines the best price we can pay for your diamond. Jewelry pieces created by design houses carry prestige which may enhance the value of your pieces. A list of top diamond jewelry design companies whose designs we prefer includes: Cartier, Tiffany, Arpels, Harry Winston and Van Cleef. The formal manner for a diamond appraisal is to measure the stone against the standards of “The Four C’s“. As with all transactions, The Gold Rush will serve you with the utmost in courtesy and discretion when you are ready to sell your diamonds. We are the place to sell diamonds in Boston!